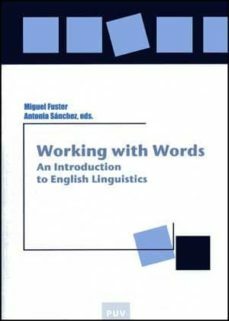 This is the companion site to the textbook Working with words: An Introduction to English Linguistics. Here useful additional activities and information related to the contents proposed in this book are freely available. We have included a variety of text-based and multimedia self-assessment exercises and supplementary activities similar to those found in the book. There is also a section called projects which features information cards for in-depth reading and tasks which require students to reflect on the topics related to those dealt with in the book. In this way the book and on-line materials are designed to cater for the needs and purposes of syllabi at different universities. Finally, a basic glossary of technical terms encountered in the book and regularly updated links are provided.Instructors who are currently using or planning to use Working with Words are kindly invited to send their proposalsto Barry Pennock-Speck. The only condition for the acceptance of activities or tasks sent to us is their quality and suitability.